Former real estate blogger Derek Burress who left blogging nearly four months ago to devote time to writing novels has kindly dropped by the Tomato to offer his advice on helping others find their writing voice. Toni Morrison once said, “If there’s a book you really want to read but it hasn’t been written yet, then you must write it.” Have you ever found yourself wanting to write a book or blog but found yourself not knowing what to write? If so, I have some good news for you. The answer to this question is simple; you should write about what’s been in front of you the entire time: the same stuff you enjoy reading. If you enjoy reading romance novels, you should write romance novels. If you enjoy reading about real estate, you should write about real estate. Simply because you’ve read articles, books and magazines about these things for so long, that you’re already aware what type of articles and stories work, and which ones do not. In addition, your passion as a reader for these things will further help translate into your passion as a writer. When I first started blogging, I enjoyed reading about baseball and real estate. My blog was a mess of all sorts of things that I found interesting. Over time, my interests evolved into a passion for fiction and history. By utilizing my passion for fiction and history, I was able to write my first novel. A book about a fictional character, Elizabeth Paramore, who joined the Army Air Force (the predecessor to the United States Air Force) as a pilot, ferrying aircraft from factories to military bases, and towing drones (aerial targets) during the gender-sensitive days of World War II. What type of books (or blogs) do I enjoy reading? What kind of books do I gravitate towards when visiting the bookstore or library? If you’re the type of person who enjoys a vast array of genres and authors, ask yourself who your favorite authors are and focus more on the author and the things he or she enjoys writing about. As a writer, it is very important to know the genre you are targeting. Every book should fit into a specific niche. A book written without a specific niche can be difficult if not impossible to sell. If you enjoy reading Westerns, and discover that no one is publishing Westerns anymore, then there is no point in writing Westerns if you intend to publish and sell your book. In this case, you need to improvise in order to be able to sell your book by changing your reading habits. If you enjoy reading horror stories about UFOs and discover novels involving little green aliens are no longer being published, you can try switching to the genre?s current popular form. In this case, horror stories that contain skulls and ferocious dolls, or you can switch to a similar genre that is currently being published. Take for example, my favorite book The Caine Mutiny, first published in 1951 by Pulitzer Prize winning novelist Herman Wouk. The Caine Mutiny makes use of Wouk’s experience as a Naval officer in World War II to evoke a drama of duty, courage, and psychological insight. Books like Wouk’s I have discovered, are no longer being published, however romance novels are. In writing my first novel, I was able to combine my love for historical fiction books like Wouk?s, and write a romance novel which ironically, takes place during the same time period as Wouk’s book. By switching to a similar genre that was still being published, I was able to combine my passion for historical fiction into a romance novel, and also share with my readers a profound love of reading real estate by including historically accurate buildings and places in my novel. In addition, I also enjoy reading about local people in the newspapers so by switching to romance, I was able to assign my characters characteristics similar to the characteristics of the people whom I have enjoyed reading about in newspapers and magazines. In my novel, I was also able to take advantage of some incorporating into my novel some of my favorite real estate bloggers as well. Take for instance, Greg Swann of the nationally syndicated real estate blog, the Bloodhound Blog. I enjoy reading the Bloodhound. In fact, it’s one of about two real estate blogs that I still continue to read. But the hound’s publisher Greg Swann tends to have a major problem answering his email, so in my novel, guess what’s in there, a lazy bloodhound! Growing up, I used to enjoy listening to the blues. One of my favorite albums is Ry Cooder’s Crossroads. 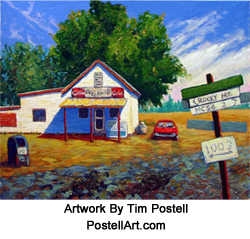 One of the major scenes in my novel take place – you guessed it; at the crossroads. The central character in that scene, none other than Abe and Lorraine Greenwood characters whose names I came up with after doing some research on Robert Johnson’s original song. Greenwood of course, is Greenwood, Mississippi one of the many places where Johnson himself was thought to have traded his soul to the devil for ability to play the guitar. The bloodhound which I attributed to Swann is none other than the famous hound Johnson said had gone mad with his long soulful moans which the devil claimed in return, was the sound of the Delta blues; the same sound Johnson just had to have. Swann of course, is not only a talented real estate blogger, but also, a talented novelist whose writing style is one which I wouldn’t mind having myself. You can find Swann’s collection of short stories on his blog online at Presence of Mind. Focus on sub-niches and genres. If you still can’t think of anything to write about, just do like the Queen of Real Estate Blogging herself does and write about whatever just happens to be on your mind at the moment. On the other hand, if you’re a blogger who enjoys reading and writing about real estate law and find that no one is publishing articles about real estate law, you can focus your writings on sub-niches; like duel and designated agency or divorced real estate commissions; a niche which Swann himself often enjoys digging his paws into. If you’re a mortgage broker or loan officer who finds posting daily mortgage rates like Rhonda Porter does on Rain City Guide each Friday afternoon boring but have a passion for politics, you can pull a Brian Brady and write about legislation that has a profound influence on the mortgage and loan industry. If you enjoy writing about real estate and taking pictures, try combining your talents for the two like Athol Kay has done with his Bad MLS Photos of the Day. Writing is thinking on paper – William Zinsser. If you still can’t think of anything to write about, just do like the Queen of Real Estate Blogging herself does and write about whatever just happens to be on your mind at the moment. Of course, I wouldn’t advise you to blog naked like Ardell herself has claimed to do. Perhaps you can hide behind a bunch of clothes in a dark closet like I’ve been known to do. Brian Aldiss once said, “There are two kinds of writers: those that make you think, and those that make you wonder.” Whatever you do, don’t turn to the bottle like Edgar Allen Poe, Scott Fitzgerald, Earnest Hemingway, John Steinbeck, and Eugene O’Neill were known to do. Instead, do it the way Nathaniel Hawthorne, Mark Twain, Upton Sinclair, Emily Dickinson, Henry Thoreau, Ralph Waldo Emerson, and Tom Wolfe did, by remaining sober. Don’t leave your clients wondering! Thanks Derek, glad you stopped by the Vine. That explains a lot about you, Derek. You are obviously someone who can’t be “swayed” by Mr Kiefer because the rest of the wardroom is. I consider that book to be one of the greatest written. Hey these are very helpful article writing tips, I totally agree that one needs to know who is the target audience before writing.